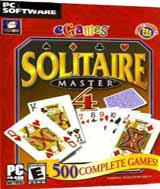 Solitaire Master 4 includes a HUGE selection of solitaire games, from favorites like Klondike and Free Cell to completely new games. With 500 total games, you are sure to find a version perfect for you. Comments: This is the best Solitaire game I've seen so far. There are so many types of games, you can't decide which to play first. It keeps your score and if others want to play it keeps theirs too. I'll keep this one handy for those eveings when i just want to chill with some lite entertainment. Comments: If you like playing Solitaire, any version, versions you never even heard of before... This is the Game for you! I am so happy with this collection of solitaire games and the options they have.... such as different card fronts and backs, and Backgrounds.... I have added this to my Favorites list and I think I can come play it everyday and never bore of it. I highly recommend this game collection to you! Anyone! Just Try it!